So often in personal injury lawsuits I have filed in Georgia involving injuries sustained during a car wreck, the defense attorney boasts that the plaintiff wasn’t wearing her seat belt, the jury will know it and, voila! Defense verdict! Not so fast!! Many times, even a seat belt won’t prevent a serious or even fatal injury in a car wreck. I was reading some Georgia news about car wrecks recently and came across a tragic incident in which a pregnant mother was killed in a car wreck even though she was wearing her seat belt at the time of the wreck. This happened in Cherokee County, Georgia, just north of Atlanta. The young woman was alive and alert at the scene, but died at the hospital as the doctors there tried to deliver her baby by C-section. She also had a three year old in the car at the time of the wreck who was in a proper car seat, had visible injuries at the scene, and, thankfully, survived. The fact that Officer Gideon (great name, by the way) had to crawl through the back window of the SUV to get to this driver reminds me of the time 19 years ago now in which I was driving a mini-van and was t-boned by a drunk driver. I was wearing my seat belt and when the van finally came to a stop on Juniper Street in Midtown Atlanta, the van was on it’s side and I was hanging from the seat belt. Several wonderful eyewitnesses walked through the back window of the van and unlatched my seat belt and helped me out of the van. I suffered a pretty severe injury from this wreck. Very recently, we learned of another tragic car wreck that resulted in the death of a teenager in Lumpkin County, Georgia. The teenager’s younger sister, who was also in the car, was also seriously injured. Both had been wearing their seat belts. There is no dispute that seat belts have saved lives. 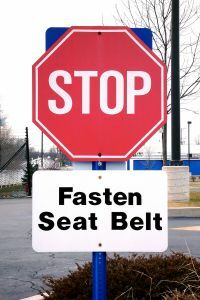 The CDC in Atlanta estimates that seat belts have saved 255,000 lives since 1975. And, by the way, you can thank a trial lawyer for mandatory seat belts, for without trial lawyers bringing personal injury/products liability lawsuits against car manufacturers, that law never would have happened. I am simply pointing out that we shouldn’t rush to judgment assuming someone who was seriously or fatally injured in a car wreck must not have had her/his seat belt on at the time. There is plenty of evidence that even when we do the right thing by wearing our seat belts, some car wrecks are simply so horrific that you may still be injured.